Although it doesn't get as much attention as does the public health threat from growing antimicrobial resistance, over the past 50 years mosquito-control agencies have had to deal with increasing levels of resistance to their armamentarium of insecticides (see WHO document Insecticide resistance already widespread). With three serious arboviral threats (DENV, CHKV, and Zika) now making significant inroads into the Americas, and threatening Europe and beyond, the need for effective mosquito control methods is greater today than it has been in decades (see WHO Assessment: Mosquito Control For Zika). 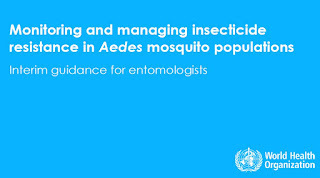 While of interest primarily to entomologists, the WHO has released a technical document on monitoring and managing resistance in Aedes mosquito populations. First a link and the WHO summary, after which I'll be back with a bit more. Insecticide resistance monitoring in field populations of Aedes is required to determine the levels, mechanisms and geographical distribution of resistance in order to select appropriate insecticides for vector control. Evidence-based decisions will ensure that effective insecticides are selected and used. Changes in insecticide susceptibility status should also direct policy and operational decisions. This document summarizes WHO test procedures for the detection of insecticide resistance in Aedes larvae and adults including insect growth regulators (IGRs) and Bti products. It also outlines strategies to manageinsecticide resistance in countries facing Zika virus and other viruses transmitted by this species of mosquito. This document is for qualified entomologists at national and sub-national level who are responsible for evaluating the susceptibility status of local Aedes populations. Over the years we've looked at some of the newer mosquito control methods, including Oxitec's genetically modified mozzie (see Brave New Mosquito), and the use of Wolbachia bacteria (see A Mosquito STD To Fight Dengue) to combat mosquito borne infections. While these methods have sparked some concern among the public, the effectiveness of traditional insecticides (which are not without their downsides) are eroding. This study showed standard larvicides and pyrethroids used for mosquito control are still effective against USA populations of Ae. albopictus, but it also demonstrates the importance of research on insecticide resistance and the constant need to develop new tools, new insecticides, and innovative strategies to prevent the development of insecticide resistance in these critical vectors of human diseases. Another cautionary report from 2011 comes from Declan Butler On Growing Mosquito Insecticide Resistance, whose Nature News article Mosquitoes score in chemical war describes how growing resistance is threatening global malaria-control efforts. Back in 2010, in From the `Nature Bats Last’ Dept we also looked at reports that one of our most effective mosquito repellents - DEET, or N,N-Diethyl-m-toluamide (a name that, for some reason, never really caught on with the public) - may be losing some of its effectiveness. A story I followed up with in 2013 with PLoS One: Mosquitoes Less Deterred By DEET After Previous Exposure. Adaptation is the lynchpin of evolutionary survival, making man's victories against bacteria, viruses, and other pests fleeting at best.